This is so cute, are those lava lamps with hearts? Awesome sketch!! I can't wait to play!! Fabulous girl! Love how clean and crisp this design is! Your lava lamps are adorable! My daughter collects lava lamps....she would just love a pair of these for Valentines Day! I love how you glittered the hearts just slightly! Cute Denise Cute! So cute Denise! Great use of the sketch...great coloring and I love the sparkly lava hearts! I haven't seen a lava lamp in years, but these are so cool! I love the silver beads and cording tied around that cute heart too! My teen daughter and son both have lava lamps, too bad their lamps don't heart shapes :) Your card is wonderful. OMG!!! How cute are those little Lava Lights....love the sparkly little hearts and the the sketch is wonderful!!! Another wonderful card Denise!! The lava lamps are adorable and I love the sparkle. These lava lamps are so adorable. Love the hearts with a touch of sparkle. How fun is this! Way too cute Denise! Oh my, do I ever remember those lava lamps from the 70's . . . . LOL! This is perfectly adorable! I love this! Haven't seen lava lamps in a while, LOL! What a fun Valentine card! 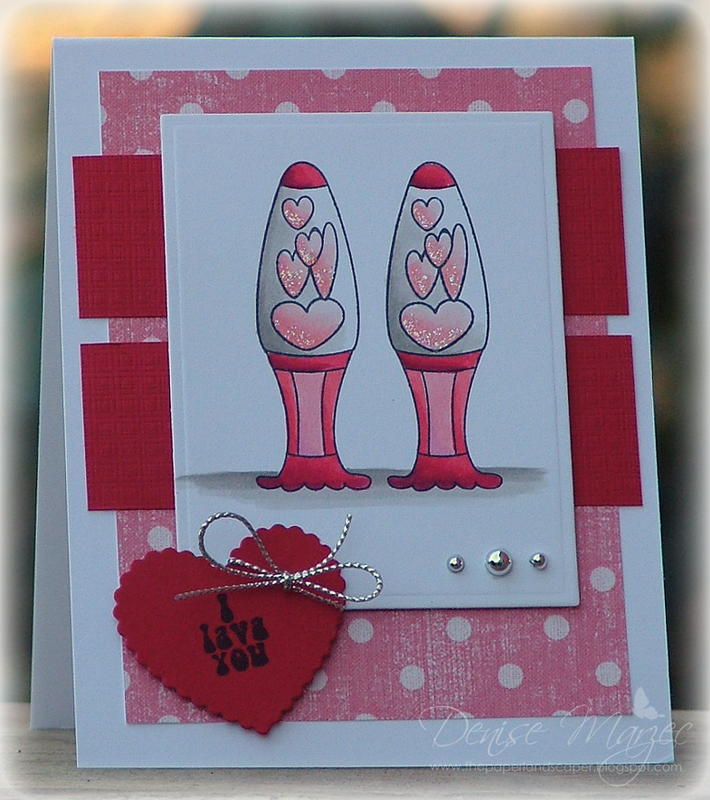 I love the glittery hearts on this cute image! What a gorgeous take on the sketch. The glittered lava hearts are too fun. Beautiful gf!! Denise, I love your card and all the possibilities of the sketch! One of these days I'm going to do a sketch while it's current... really I will! So cute Denise... I think all 3 of my girls had lava lamps at one time or another :)!! So adorable and fun, Denise...and I love the sparkle!! This is so cute! Love the pair of pink lava lamps and the colors are wonderful. so cute and I love the sketch! Groovy card baby! Cool image and great use of the sketch.